Longest: Can-Am 250; best finish is 2nd place over a period of many years. We all race in our family, now. My wife, Amelie and my son, Tristan do some racing, too. Mushing is part of our life. I'm turning 34 in January and have been training and racing sled dogs for 23 years now. This year I'm training a 24 dog racing team. It is fun mushing dogs in this desolate wilderness country and watching each dog grow stronger. It is very impressive how well they work together; such talented athletes with great stamina and endurance. The Can-Am is both our dogs and my favorite race. Most of our teamates have crossed the finish line and this year our goal is to finish in the top 4. Our future dream is to compete in the Iditarod. My occupations are Registered Maine Guide, wild life interpreter, and professional musher. Both my husband, Mark, and I own and operate Lone Wolf Guiding Services. We love all the animals and truely enjoy our enriched outdoor lifestyle. We are back in the 250! While running the Can Am 100 was a fun ride, turns out I missed the 250. I missed the long run to Portage, I missed the egg sandwich at Rocky Brook, I missed crossing Round Pond, I missed the catnap at Syl-Ver, I missed the overwhelming feeling of warmth arriving at Two Rivers in Allagash, and I missed that long exhale on that last leg to the finish. This is the fifth 250, and my 8th Can Am races, and what keeps me coming back is not only traveling through the Maine wilderness and mountains with the dogs, but also the incredible community and friends. I live in Shelburne NH, with my disabled brother and sister for whom I am their caregiver. I work for the Conservation Fund, a national conservation organization, moving forward land and water conservation and economic development in NH and VT. I am an amateur gardener and planted my first garlic this year, which is a bold move as I consistently fail to grow zucchini. Another musher, Ryne Olson, responded recently to the common question about what one likes about running dogs, and I'm going to steal her answer here. Ryne wrote "This question stumps me every time. I love everything about running dogs. Perhaps a better question - what do you love most about life? Answer - running dogs." Looking forward to our time in Fort Kent in March! I've been waiting for this moment since I crossed the finish line last year! I can't wait to run it all over again, and spend a weekend doing nothing else than being with my best buds. Running the Can-Am is for me, a vacation away from everyday life, while bringing out the best from myself and my team. HI everybody, I'm back again to run the 250 mile race with my siberian huskies, It's going to be my 5 th time and each time my dogs do better. lt�s always fun to meet the people of Fort Kent and the other mushers. When I was 8, I hooked our house dog, a big St-Bernard, to a sled!!! Then, one day, I saw a team of several dogs and that's when I realized that I wanted to harness more dogs. As a teenager, I was doing sprint races and it was only in 1996 that I actually started doing long distance races, racing from 60 miles to 400 miles races, the year I ran the Labrador 400. I climbed the ladder and I started winning the Can Am Crown 250 (Fort Kent, Maine) in 1998, then in 2018, I won it for the 9th time, the fifth time in a row. I did the race circuit in North East North America, but in 2003 I realized my dream of running the Yukon Quest (1000 miles), where I placed 6th. In 2015, I won the Hudson Bay Quest in Manitoba (220 miles) the first time participating. In the near future, in 2020, I plan to run the famous Iditarod in Alaska. What I like most about dog sledding is to be outdoors in nature, discovering new territories and especially listening to my dogs and realizing that we are an amazing team between human and the beast. The most exciting thing about mushing, for me, is the trust between the dogs and the musher, the tie that binds, when the dogs work for me and give the best of themselves. My family is very important for me because my wife, my daughter and I are doing an amazing team work that makes it possible for me to combine mushing and my "official" job. I also have guided for dog sledding for tourism for outfitters at Daaquam in 2004-2005. I have been a musher at Fermont, in the grand north of Quebec since 2013 running an average of 2200 miles each winter, with many expeditions in camping for several days. My wife and toddler and I have a kennel in Northern Minnesota. We take turns racing our main team and have competed in The Beargrease marathon, UP 200, and Can-Am a few times. We enjoy the trails and the people out here in northern Maine and its always fun to take a road trip with Ward Wallin for a dog race. My name is Guillaume Lizotte, I come from Vall�e de la Matap�dia and I am a forest firefighter on the Cote-Nord. Passionate about nature and wilderness since a young age, I grew up with the dream of having my own team of sled dogs to one day compete in this environment. I first started with the sprinters and a few times after I turned to the long distance. Now I've aquired my own team and I'm proud of it. For me there is nothing better than going to the forest with them and feeling that we are one. With all the time we spend together we can say that they are like a family for me. I started mushing back in 2008 and have been racing since 2009. Yves Carrier was my mentor and I can�t thank him enough for introducing me to this addictive sport. The dogs are amazing and just when you think you know everything they surprise you and teach you something about yourself or them. There is nothing better then the quietness you experience on the back of a dog sled with your best friends . After a couple years away from the race, l�m looking forward to racing the Can Am. I can't wait to see some old friends, tip a few "Sea Dogs", and see the great state of Maine by dog team! I�ve been racing for 20 years. What started out as a recreational hobby with rescue dogs soon became a complete addiction ESPECIALLY once I started doing distance. In 2008 I danced with the grim reaper, I survived death and since then my focus is to LIVE and always do what I love to do. What keeps the fire in my soul, what makes me appreciate & love life are my dogs and that is why my favorite race in the NE is the Can-Am 250. It�s all about the care, love & bond that you have with each and everyone on the trail & off the trail. lt's about being their provider, coach, nutritionist, behaviorist, doctor and mom. It�s incredible to watch them grow into amazing athletes and know that your were the one to see the quality in them, to bring out the best in them to help them excel! lt's not just about the training miles it's about enjoying the beauty of the trails and the team you've created! La Can-Am 250 est un vieu r�ve. Cette annee, je travaillerai fort pour finir cette course. Mushing is a family story for us. All our family is involved in the sport. We are happy to return to the CanAm, our favorite race of the season. Hoping to run a new set of young leaders in the race. When not training dogs we enjoy participating in road races and recreational hikes together. My wife, Manon Moore, and I like to come to Fort Kent every year. We train 17 dogs together. We run this race for the fun of it and to meet friends. I like to be alone with my dogs all day long and hear the sound of the sled on the snow. I like Moose, Deer and bear hunting. I love to be in Fort Kent for the Can-Am. Florence is only 13 years old but she has been dogsledding for a couple of years. She lives in the north of Quebec and she runs dogs in the wilderness in really cold temperatures, She has made dogsled trips of 20 to 50 miles often in winter time! What I like most about my dogs is their genuine happiness while running, and that keeps me living the present moment, which is awesome therapy! I am excited to come back to Fort Kent and see old friends, and especially my host family the Saunders, who are family to me! I became interested in sled dogs and long distance racing when my Mom introduced me to the sport through a homeschool unit study at 9 years old. I started a kennel in Ohio at age 14 and moved to Nature's Kennel in the Upper Peninsula of Michigan 4 years later. Since then l have had the joy of racing our Nature's Kennel race team all over North America, including three 1,000 mile finishes so far. I am married to the love of my life, Ashley Patterson who will be competing in the 250 again. I am very lucky that we have been able to train dogs together all winter after another very busy summer. We start, spend all day, and end each day together with each other and the dogs. This year is my first100 and there is no way I could be here today without her. My favorite thing about the dogs is that I know they are doing this for me. I am a member of the Penobscot Nation, a traditional artist specializing in birch bark baskets. My wife, Lori and I, enjoy canoe racing, hiking Maine�s appalachian trail, and cross country skiing. I also enjoy oil painting. I have run sled dogs since I was 12 years old. It's a passion that I share with my family and many tourists during the winter. I have run the Can-Am 60 in 2014 and 2015 and I think it's a wondeful race with a great volunteer team. This year we are running the 100 miles , and next year we will try to run the 250! I am a second generation musher from New Hampshire and I have been on the runners ever since I could stand . With a love for dogs and being in the woods, mushing has always been a part of my life. My team just recently returned from racing in the French Alps and are excited to run at this years Can Am. Thank you to everyone who has helped get me here and I look forward to another great race! I have been racing the Can-Am race since 2008. We always love this event and are always so happy to make it back each year. We love seeing all our musher friends and everyone that puts on this amazing race. Definitely one of our favorites! A graduate of Musician's Institute, Jaye spent 15 years pursuing a career in music as a rock guitarist, releasing 2 independent CDs in the late 90's-early 2000's. She would still likely be inhaling second-hand smoke in small dives across the country if she hadn't purchased a 10 week old siberian husky in April of 2000, discovered the world of dog-mushing, and became addicted to inhaling dog fur instead. Since nobody in Jaye's family does anything simply as a hobby, it didn't take long before 1 dog became 8 and then 16 and now 30+. In 2007 she ran her first Can-Am 250, discovered she really liked being sleep-deprived and exhausted, and has continued to enter races that make her mother worry needlessly ever since. My husband Andy Bartleet and I work for the Outward Bound, running wilderness expeditions in the most beautiful and wild regions of the State of Maine. 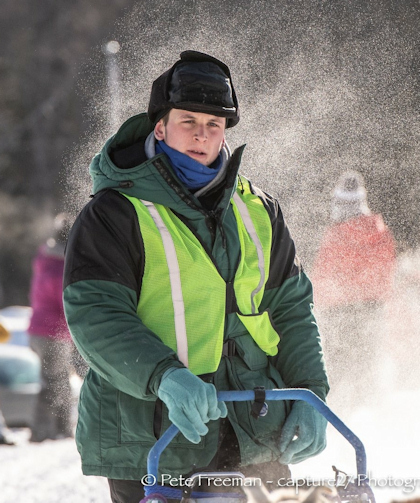 The courses use the challenge of wilderness travel to develop students' strength of character, their ability to lead and a desire to serve others. 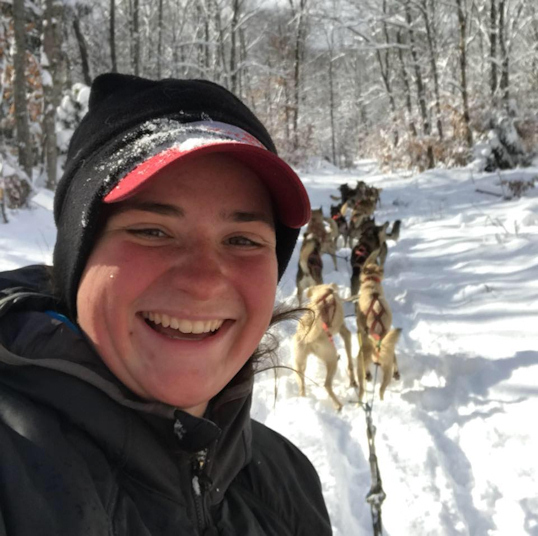 At home in the winter, we devote ourselves to mushing, and our canine characters use their leadership talents to instill in us a desire to serve them. Both programs are highly effective. We run a guide service called Mornington Crescent Sled Dogs (wwwsledpetscom see link above), which introduces people to mushing. We look forward to the Can-Am Crown each year for the community involvement, the dedicated staff and volunteers, and the spectacular trails. I've been running my own team of dogs since 2009. This is my first race. I enjoy going to Fort Kent. The people are friendly and the Can-Am is a fun race. Last year 1 was a rookie and it was my first race ever. and 1 am back this year because the event is awesome! This year I am back to have fun with dogs on the trail! 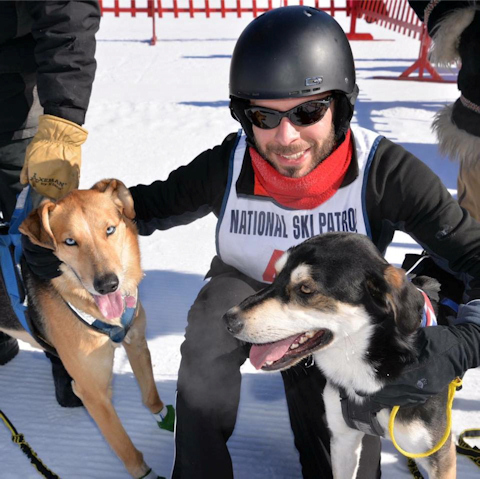 For the past few years Kelley and Fran Plaisted have combined their small kennels, made up of mostly husky/pointer crosses, to compete in both sprint and mid- distance races. After several seasons of handling for friends at the Can Am races and competing in the Ft. Kent skijor races, last year they decided it was time to enter their own team in the 30 mile race and had a great time, so they are back to try it again this year. Other Dog Sledding Experiences are lots of racing and just having fun running dogs and skijoring in New England, Alaska, Canada, and the mid-West. This is my third time running the Can Am 30, the first year was the only time I didn't finish a race , the second year I was recovering and ran 5 dogs that I could handle, now I am bringing my best yet, and next year the 30 milers look even stronger! My ultimate goal is to run and win the 250. My name is Matthew black. Everyone calls me Junior. I have been sled dog racing and handling for about 5 years now. I am a sled dog tour guide. I have 42 dogs (kids). I live in Western Maine with my wife Caroline Blair-Smith and our family of sled dogs. We run a small guiding business in the winter, which helps feed the dogs, if not us. Guiding also helps us share the work ethic, the fun, the funny and the downright weird personalities of our dogs. When not guiding, we are running for fun, because if it's not fun, why do it?. Our kennel has taken over most of our property, enabling us to give the best living conditions we can for our dogs, with lots of shelter, natural terrain and socializing. We have a lifelong commitment to the dogs, so we have youngsters, retired dogs, dogs that like to race, dogs that like to pull hard, dogs that love people, and some dogs that just like to come along for the sightseeing when we run, they all have a place and value. 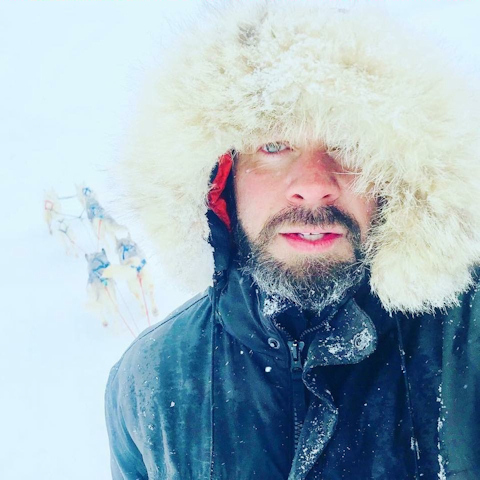 l'll be running the l00 mile race because I think the dogs will have a blast, and it gives me a focus for training, and getting out and enjoying the challenges of a typical New England winter. Hello Fort Kent, it's been a while since I have raced here, but now I have a young team of dogs all ready to go, so here we come! Looking forward to seeing the O'Malley family and everyone up in Fort Kent. Thank you to my family for making it possible for me to enter the race. Jonathan Hayes, a Tennessee native, chose to make the St. John River Valley his permanent home 10 years ago. He is most known locally as the lead singer of the country rock band "Tennessee Haze" but he is also a published author and poet. After serving in the US Marines, Hayes combined his passion for outdoor adventure and dogs and became a musher. For the past 18 years Hayes has dedicated his mushing to the preservation of the rare Seppala Siberian Sleddog breed in the "Poland Spring Kennels" which comprises his team for this race. But his greatest dedication is to his role as a father and husband. Its been a season of growth and change for the kennel in many ways. This year we are going to take it easy and enjoy the Can Am 30. We love the Can am and look forward to come back every year. The trails are beautiiinl, the volunteers are amazing, and the atmosphere is thrilling. We look forward to seeing everyone again this year and having a great race. Happy and Safe trails to everyone, and good luck! I bought my first husky, Ishka, almost three and a half years ago. She was the light that sparked my love for huskies and my muse of letting them do what they were bred to do. I was born in Pittsburgh, Pennsylvania but grew up in Virginia. When I first started out with my small pack I was just doing conformation dog shows and canicross. One day I just decided to buy a house and move to northern Maine to jump head first into conditioning and racing. My heart is with purebred Siberian Huskies and the Seppala line and there is no place I would rather be than out on the trails with them. I hope to help my team reach their full potential. While I don�t plan to enter my team in the race this year, I do plan to enter with them next year when I believe they will be more prepared for it! Young mom that is dog sledding seriously since only two years but passionnate about dogs since always. I am entering my first mid-distance race ever! The trail ahead is fresh and new. It awaits plenty of paws from Thesewoods Kennels. Lily, Tini, Poe, Rye and all the dogs bring wisdom and fearlessness. They inspire and transcend that which I am yet to know. I write this as a newcomer to Can-Am and as a rookie to sled dog racing. This is my second race and I�m already completely hooked. I thank Ingrid Bower and her amazing team of Siberian huskies for this run and all they do. I hope everyone enjoys the journey as their team takes them through these woods and over the finish line. The dogs are ready and excited to go. I have been running sled dogs for 6 years, competing in mostly mid-distance races. My family and I currently have a kennel of 13 pure-bred Siberian Huskies, all of which are named after Star Wars. I have competed in 2 Can-Am 30's placing 4th in both (2015 and 2016), and one Can-Am 100 (2017), placing 5th. My team's most recent adventure was to Alaska this past season (2017-2018), to compete in the Junior Iditarod, a 150 mile race in Alaska. My favorite thing about mushing is being a part of the bond between the musher and the team. I am very excited to return for my second year to the CanAm Crown. Last year my husband and I ran the 30 mile and really enjoyed the beautiful and ever so challenging trails. Maybe one day we will be back to take on the 250 mile CanAm Race! Until then, we are hoping to run the Canadian Challenge in 2020. Thank you to the community of Fort Kent, the race organizers and volunteers for being so welcoming! We are very happy to end the season running the CanAm Crown. I am happy to be back at Can Am once again! I love this community and I love this race! I hope to be back to run the 100 next year. Steve is a wildlife ecologist and science teacher by training, but now focus his diverse skills on training others to run outdoor education programs around the world as the training manager for TimberNook. He started mushing with his daughter, Lara Renner who is probably going to place higher in today's race than Steve will. Steve and Lara have shared many adventures on the trail together since 2013. When there's no snow on the ground, Steve coached softball and learns piano duets with his younger daughter, Mackenzie. Steve also enjoys photography, road cycling, running, and year round team sports. This is my first year racing the Can-Am. I have been at this event the last two years as a spectator and handler. I am in awe with the energy and environment that this race has to offer. My goal is to race the 250 with dogs that have been born into our kennel and raised with my family. I am competing today with 4 out of the 6 dogs that my family has trained and raised. Next to watching my 13 year old daughter finish her first 30 mile race this year nothing brings me more joy. I love to run my dogs, We are here to have a fun run! My wife and I, from Rajenn Siberians, have been running competively and recreationally for l0 yrs. We have a kennel of 27 purebred Siberian Huskies in southern Ontario. This is our 2nd year running the Can-Am and our first time running the 100 mile category here. 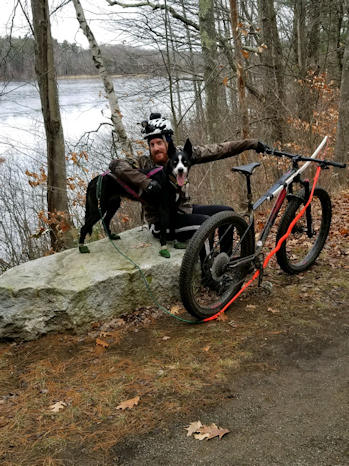 We love getting out and enjoying trails with our canine companions and our future goals include various races to allow us to explore new experiences. I have been racing sled dogs for 13 years. Despite having run dogs for so long, this is a serious rebuilding year for me. So unlike other years where I've come to Can-Am to do as well as possible, I'm really just here to experience the wonderful race, see old friends and enjoy my dogs on the beautiful trail. After watching my wife run this race for many years, she's finally (two nights before the race!) given me permission to take the handle bars. Over the last few years I've done many of the longer skijor races around New England and 2019 has been my first year racing on a sled. l�d also like to thank Bailey for lending us a couple of his dogs so we could make the team. Each race is limited to 30 teams. Rules were posted on October 4. Entry forms are posted on November 1. Applications received before the random drawing on Sunday, November 19, are treated as if they were all received on the day of the drawing. While encouraging early applications, this system also allows time for applicants to read the rules, fill out entry forms accurately and completely, and find a way to submit their applications by email, fax, snail mail, or other means. On November 19, the Can-Am Crown Directors meet for the initial drawing of bib numbers. For example, if 50 acceptable applications for a race have been received by that date, then there would be 50 numbers drawn for that race. Directors use a lottery ball machine to pick bib numbers as they go down the list of applicants. Bib numbers 1 through 30 become confirmed entrants. Numbers greater than 30 are put on the waiting list in the order drawn. After the drawing on November 19, numbers are assigned in the order that acceptable applications are received.